Snowplumes: Voice Of Earth - Didgeridoo. It was while strolling in the lanes of renowned pilgrimage centre Rishikesh I came across a unique drone tune of a wind Instrument. I curiously banked upon the shopkeeper nearby to know about the unique music being played. He replied it was Didgeridoo..!.The name was indeed a tongue twister and instrument sounded different.!
. Made of hollowed out branches from eucalyptus & bamboo trees with Beeswax smeared around at one end to create a mouthpiece, and when the didgeridoo is blown it will soften to form a seal around the player's mouth. Sound levels inside the players mouth can reach 100 decibels, which is as loud as a chain saw. Many Native Australian cultures used the didgeridoo during their religious ceremonies. The music from the didgeridoo was used to accompany singing and dancing during these rituals and, the instrument could only be played by men. The style of play was passed down from the generations and, this style is still difficult for the western player to replicate. Although women were not encouraged to play the didgeridoo they were able to do so in informal situations. It wasn't until the 1920's that the term 'didgeridoo' came into widespread use. Its origins stem from Herbert Basedow who was an Australian anthropologist. He spent much time living with various Native Australians. He is believed to have named the instrument after the sound that is produced whilst the instrument is being played. According to the research done by British Medical Journal playing the didgeridoo for 25 minutes a day over a 4 month period can improve breathing during the night and can cure Sleep Apnea, or Obstructive Sleep Apnea, ( Snoring ) is a common sleep disorder in which a person’s breathing momentarily lapses during sleep. The reason behind the didgeridoo’s success as an alternative treatment lies in its promotion of a process known as “circular breathing.” Circular breathing occurs when you breathe in through your nose and out through your mouth at the same time. Certain sound frequencies affect the brain waves in the bodies to the extent that they naturally produce endorphins that stimulate the body to move, such as dancing, creating a happy euphoric state. According to brain research studies other sound frequencies emitted by certain musical instruments produce a state of mental and physical relaxation in the body. The importance of this “relaxation response” as it has been termed by the medical community is that in this “theta” state that is where the deepest healing of the mind and body occurs. Sound therapy, therefore, is now being used for its healing properties by health care professionals under the category of complementary therapies or integrative medicine. It is said that the didgeridoo is one of the most primordial sounds on the planet. Thus, it has the ability to open memories of the past. 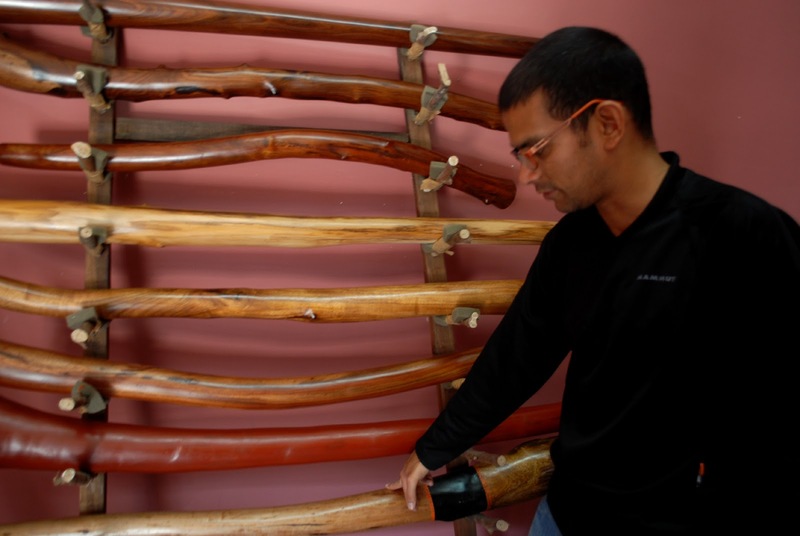 The droning sound of the didge is most similar to that of the Hindu and Buddhist chants. Phil Jones, one of Brian's didgeridoo teachers, said that the didge takes him in 10 minutes what used to take two hours with meditation. Music is a universal language that transcends cultural differences and barriers.Didgeridoo is found popular in India also.It is popular in Pushkar, Goa, Varanasi and Rishikesh also.Manufacturing unit has been set up at Rishikesh ; Uttarakhand recently and is available for the needy to suit the wallet. Internationally renowed musical band ‘ Shoonya’ had performed a musical evening in June 2010 in Bangalore.Renowed Percussionist and founder of Shoonya Mr.Mohan Gopi resident of garden city says that after the show few Bangaloreans were also fascinated by this unique Instrument and are learning at ease.